Nothing much further to say about this milepost. We’re down to 20 days to go what we understand is the deadline, and we’ve risen to 165 days since the crash. We remain hopeful that this response will happen when we’ve been told it will. It has been delayed far too long already. A highly dedicated group of over 15 walkers/cyclists attended the WalkUP Roslindale/Rozzie Bikes led tour of the proposed route of the Roslindale-Arboretum Gateway Path as part of the ongoing LandLine tour series this summer. Photo gallery below. We (your co-hosts, Alan Wright and Matt Lawlor) were honored with the presence and commentary of Nina Brown from the Arboretum Park Conservancy, who spoke about APC’s efforts on extending the Blackwell Path, and from Matthew Jordan (Director of Finance) and Andrew Gapinski (Manager of Horticulture) from the Arnold Arboretum, who gave us a sense of the Arboretum’s perspective and continued support for the RAGP concept. Peter Sutton, from MassDOT Planning, represented the LandLine Coalition. We started at the northern end of the Blackwell Path, across from Forest Hills station, and wound our way down the Blackwell Path, its proposed extension route, and then up Peters Hill and into the densely-wooded MBTA property adjacent to the Needham Line tracks to the shelter at the southern end. We owe special thanks to Peter and key MBTA staff, especially Mark Boyle (Director of Real Estate), for allowing us to access this portion of the route on very short notice. 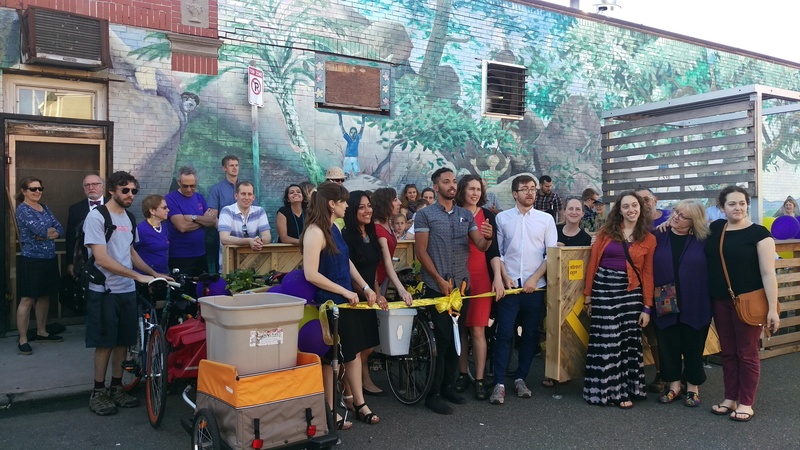 We concluded our tour at the recently-installed bike corral on Cohasset Street in Roslindale Square, which is getting brisk use along with the adjacent parklet. We look forward to more opportunities to walk/bike the proposed Gateway Path route with neighbors and friends from Roslindale and around the region. Just a reminder that WalkUP Roslindale members Alan Wright and Matt Lawlor will be leading a ride/walk along the approximate route of the proposed Arboretum Gateway Path this coming Friday, June 24, 2016 starting at 4 pm at the Forest Hills entrance to the existing Blackwell Path. The ride/walk is part of MAPC’s LandLine summer rides. More info can be found here. We would love to see a strong turnout for this event! I understand from a conversation I had late yesterday with Charlotte Fleetwood, BTD’s Vision Zero Coordinator, that the expectation is that the full set of safety improvements for Washington @ Blue Ledge will be installed by the middle of July. To be completely clear, Charlotte did not guarantee installation by July 15, but I’m going to use that date as the target. So, 30 days and counting down, or 155 days and counting up. It is now 148 days since Roslindale resident Silvia Acosta was struck and killed by a hit-and-run driver while walking in a crosswalk near the intersection of Washington Street with Blue Ledge Avenue. To date, the city’s sole response has been to place a vehicle speed monitoring sign on the northbound side of the street. And that’s it, for what is supposed to be a high-profile Vision Zero “rapid response” project. WalkUP has been following this closely and we’ve heard many times that plans were close to final, that changes were imminent, and still nothing. How much longer does the city expect our neighborhood to wait for policy to turn into real action? Celebrating new bicycle infrastructure in Roslindale! It took longer than it should have given the level of community support, but many community partners, starting with RVMS but including Street Ops, the offices of councilors McCarthy and Wu, Boston Transportation Department, the BSA Foundation, RozzieBikes, and your own WalkUP Rozzie, have finally succeeded in placing a bike corral next to the parklet at Fornax. The ribbon-cutting was yesterday and we had an excellent turnout. RVMS Executive Director Christina DiLisio made the point that several thousand dollars have been raised and is now available for more bike infrastructure in the square generally, so hopefully this is just a sign of much more to come.